You may be a candidate for partial dentures if you have one or more missing teeth, and the space they once filled is surrounded by other teeth or permanent restorations. To find out more about whether partial dentures are right for you, schedule a consultation with Drs. Lewis and David Morrison of Morrison Dental Care today! If you decide to get a partial denture, you’ll need to visit Drs. Lewis and David Morrison to have metal clasps attached to your surrounding teeth and an impression made of the area your partial will fill. The impression will be sent to a dental lab, where a technician will fabricate a custom denture that includes a gum-colored base that will fit securely over your gums. A metal framework will be used to attach your new partial to the clasps on your natural teeth to ensure a secure fit. Yes. Good oral health is still important – even if you have a few missing teeth. In addition to caring for your new dental prosthetic, you’ll also need to brush your gums and tongue twice daily to stimulate circulation and remove bacteria that could cause gum disease. 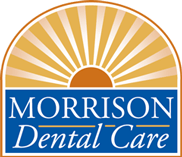 Continue visiting Morrison Dental Care twice yearly for exams and cleanings, and be sure to bring your partial dentures along to each visit. After a few years, you may find that your partial needs to be rebased to better fit the changes to the bone structure in your mouth. If you are missing one or more teeth and thinking of getting dentures, you will first need a professional consultation with Drs. Lewis and David Morrison. During this time, you can explore your tooth prosthetic options, ask questions, and make a decision as to whether dentures are right for you.